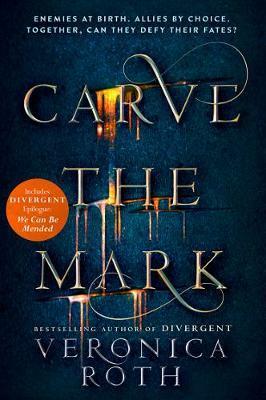 50% of people buy Carve the Mark and The Fates Divide ~ Paperback / softback ~ Veronica Roth. Veronica Roth's breathtaking fantasy captures an unusual friendship, an epic love story, and a galaxy-sweeping adventure. CYRA and AKOS grew up in enemy countries on a vibrant yet divided planet. Cyra's ability to transfer extraordinary pain with a simple touch makes her a dangerous weapon for her tyrannical brother. When Akos is kidnapped and forced to serve Cyra, it's clear that their hatred is mutual. But as Akos fights for his survival, he recognises that Cyra is also fighting for hers, and that her true gift - resilience - might be what saves them both. Their world is on the brink of political chaos, and Akos and Cyra must decide if they will fight for what's right, even if it means betrayal of their families and countries. When the time comes, will they choose loyalty or love? An exclusive extra story for DIVERGENT fans WE CAN BE MENDED, A Divergent Story will be included in this paperback. Veronica Roth tells the story of Four 5 years after the events of ALLEGIANT.